Berni Moestafa manages the day-to-day operations of PT BowerGroupAsia Indonesia, helping define and oversee the implementation of strategic priorities, providing leadership and serving as a mentor to a team of analysts and ensuring that client products meet the highest standards. A journalist for 15 years prior to joining BGA, Berni brings a wealth of experience and expertise to his role. Berni previously worked for Indonesia’s leading English newspaper, The Jakarta Post, as well as Xinhua Finance and Bloomberg News. At the Post, he covered Indonesia’s economic and political transformation following the 1998 Asian financial crisis. As deputy bureau chief of Bloomberg in Jakarta, he helped lead and manage a team of reporters covering Indonesia’s top investment, industrial and political news. Berni has spent his entire career reporting on, analyzing and explaining the complex relationship between business and politics, which underpins the decision-making process in Indonesia. 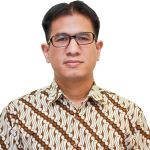 Berni received a bachelor’s degree in economics from Universitas Gunadarma in Depok, West Java, and received a Fulbright Scholarship to study at City University of New York, where he received his master’s degree.